The File menu item has the following options. The SharpCap Settings defaults have been chosen to enable ease of use of the application with minimal configuration required after installation, however adjustment to the settings can be made here when necessary. See Configuring SharpCap for a detailed description of the four tabs General, Hardware, Filenames, and Startup Scripts. Selecting Exit or Alt+F4 will perform an orderly shutdown of SharpCap. 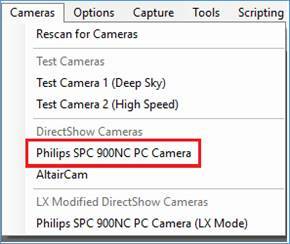 The Cameras menu item allows selection and de-selection of attached imaging devices. These may be cameras or video capture devices (frame grabbers). Different types of camera are grouped into different sections of the menu – each section is headed by the description of the type of camera in that section – i.e. ‘Altair Cameras’, ‘DirectShow Cameras’, ‘ZWO Cameras’, etc. Normally a new camera will be detected automatically when you plug it into your computer, but in some cases you may need to use the Rescan for Cameras option to detect a newly added camera. 1. Test Camera 1 (Deep Sky), a simulation of a capture of the M42 Nebula in the Constellation of Orion. 2. Test Camera 2 (High Speed), a simulation of a capture of Jupiter (the dark spot to the lower left being the shadow of a moon). These two test cameras can be used to learn the functionality of SharpCap without requiring a telescope and camera. If a camera connection is lost or a camera plugged in while SharpCap is open, use the Rescan option to find the device. SharpCap automatically rescans after a USB device is added to or removed from the computer. The rescan button is mainly useful to detect network connected cameras (i.e. Basler or Point Grey Gig-E cameras) as SharpCap cannot detect these being added to the network. This will close the currently open camera. A camera can also be closed by selecting the active camera a second time in the Cameras menu. Cameras are also closed automatically if a different camera is selected. This will stop then restart the currently connected camera. Under some circumstances this may help recover correct operation if a camera has become stuck or is not responding. If reconnecting the camera does not cure the problem then you may need to close and re-open SharpCap or disconnect and re-connect the camera. Select the camera to use from the dropdown list. There may be occasion when a camera appears twice in the available cameras list. If in doubt which one to select, use the one highest in the list (because SharpCap tries to put the cameras it has the best control over at the top of the list). See the Philips SPC 900NC in the graphic below. Sometimes it is useful to close the camera currently in use without opening a different camera. This can be achieved by returning to the Cameras menu and choosing the selected camera from the menu again. The Options menu item has the following items. The Full Screen option forces SharpCap to switch to full screen mode. This leaves only the Capture Display Area and Camera Control Panel visible – there are no menu or tool bars available. To reverse this situation, move the mouse pointer to the top of the screen and the menu will appear. The Full Screen option can be unchecked. You can also switch in/out of full-screen view by pressing the F11 key. In the Camera Control Panel, each control group has a handle at the top right corner. This handle can be grabbed with a mouse and the control moved elsewhere in the Camera Control Panel to suit individual preferences. By choosing Reset Control Order, the control groups can be returned to their default order. Depending on the manufacturer/model of camera connected and selected in SharpCap, other menu items may appear in the Options menu. 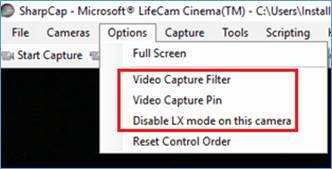 These are the additional menu items available when a Microsoft LifeCam (webcam) is connected and selected. 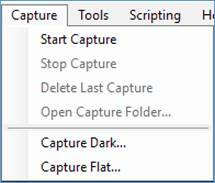 The Capture menu item has the following options. · The production of dark frames. · The creation of flat frames. See Capturing Videos and Images for a detailed description of these menu items. 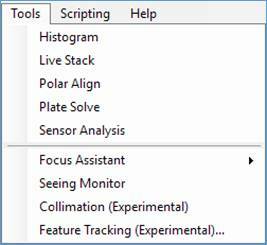 The Tools menu item provides access to specific functions which can assist in capturing images or ensuring alignment of the telescope. This option provides access to the main SharpCap histogram functionality. See The Histogram for a full description of this tool. This option provides the same functionality as the Live Stack button located on the Tool Bar. See Live Stacking for a full description of the tool. Selecting Polar Align will produce a set of screens to manage the alignment process. See Polar Alignment for a detailed description. This tool initiates a “blind” plate solving search to determine the celestial co-ordinates of the current image. The option will only be enabled if a compatible plate solving tool has been auto-detected or configured in the SharpCap settings. The progress and result of the plate solve operation will be shown in the notification bar. See Plate Solving Tab for more details on compatible plate solving tools and configuration. 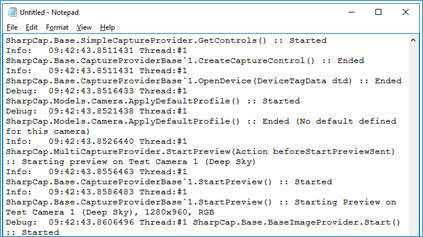 This tool launches the SharpCap sensor analysis routine which can measure the characteristics of your camera sensor. Once measured, the sensor data is stored and can be used in future to provide SharpCap smart histogram functionality. See Sensor Analysis and Smart Histogram for more details. Note that Smart Histogram is a SharpCap Pro feature. The sub-options here allow the various Focusing tools to be selected. This launches the Seeing Monitor which can help you capture Lunar/Solar/Planetary images when the seeing is at its best. This launches the experimental Collimation assistant which may help with collimation of Newtonian telescopes. This launches the experimental Feature Tracking tool, which can guide your mount during Lunar/Solar/Planetary imaging to keep the target from drifting out of view. The Scripting menu item allows access to the Scripting Console and gives the ability to run existing scripts and write new scripts. The scripts are based on Python. The functionality of SharpCap can be extended by using scripting as a built-in programming language. Scripting is an advanced topic and knowledge of it is not essential to be able to use SharpCap effectively. See Scripting for a full description. The Help menu item has the following options. View Help will display a manual, in Windows help file format, installed as part of the of the SharpCap software. Allows you to enter or check your SharpCap Pro license. Selecting Check for Updates will initiate a version check against the SharpCap website of the installed versus latest version. If no updates are available, the message below is displayed. If an update is available, a download and installation is offered. This option provides direct link to the ‘Bug Reports’ area of the SharpCap forums. Before posting a new bug report in the forums, please check to see if the problem you are having has already been discussed – there may even already be a fix or workaround for the problem! This will launch the SharpCap forums in your web browser. You will find hints, tips, guides, and discussion of the use of SharpCap and general astronomy on the forums. 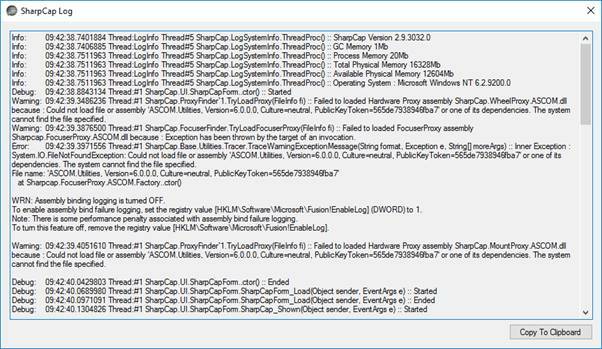 SharpCap, in the background, is constantly logging events relating to the program. Click the Copy to Clipboard button to copy the contents of the log. By opening Notepad (or other text editor) the contents of the log can be pasted and a file saved. The information on how to send the log file can be found at http://forums.sharpcap.co.uk/ . · A link to the SharpCap website. 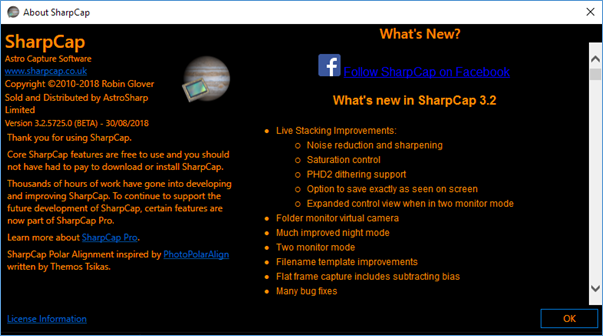 · A message informing an upgrade to a SharpCap Pro License is available. · A link to License Information. · A link to the SharpCap Facebook page. · Version and Change history. The currently installed version shown here is 3.2.5725. The About Window is shown here in the dark colour scheme.